The picture that comes to mind when one thinks of this word is the human evolution, the one shown in the picture as well. We have evolved, have we not? We have gone from apes to full-blown human beings, with our features developing along the way. 1. To develop gradually: to evolve a scheme. 2. To give off or emit, as odors or vapors. We have seen the meaning of evolve from above. The meaning of devolve, on the other hand, means to grown worse. It is the opposite process of evolve. 1. Many theories of human evolution have developed over a period of time. 2. One’s thoughts evolve as time goes by and the as the wisdom of one’s age is added to one’s thoughts. 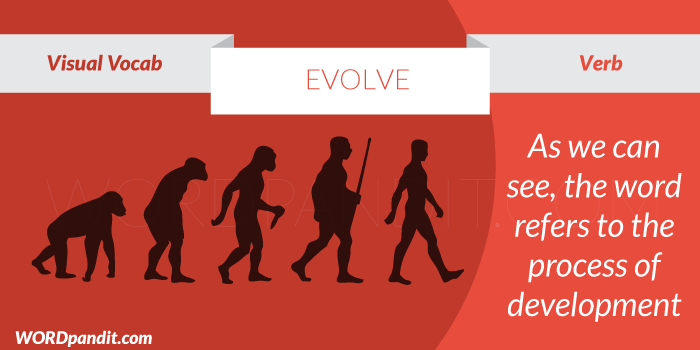 Is the second usage example for evolve grammatically correct? small grammar error..it stands corrected now..